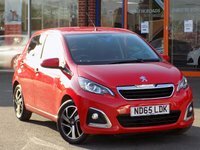 Finished in a bright Laser Red this little 108 combines style with comfort and low running costs making it an ideal first car for someone. Vehicle has had just 1 private owner from new and comes with nice features including Reverse Camera, Bluetooth, Speed Limiter, Air Conditioning, DAB Radio, Touch Screen Display, LED Daytime Running Lights and 15" Alloys. Please ask for details of our fantastic finance and warranty packages, subject to status, T's and C's apply.